Remember when Mike Trout was injured? Neither does anyone else. When Angels star Mike Trout went down for six weeks with a thumb injury at the end of May, it suddenly looked like the American League’s most valuable player title was anybody’s to claim. Would it be rookie sensation Aaron Judge? Or perhaps diminutive Astros sparkplug Jose Altuve would claim his first MVP crown. Could Boston’s strikeout machine Chris Sale work his way into the conversation? The race seemed wide open. Four months later, it’s becoming clear that we may have underestimated the best player in baseball. Trout returned from his first career DL stint after the All-Star break and started knocking home runs like he’d never left. In 51 games since his recovery, Trout has slashed .305/.457/.563, accruing a total of about 21 runs above an average player. Trout’s hitting has been so otherworldly that he has almost entirely closed the gap between himself and the best offensive players in baseball. Here’s a chart showing Trout’s Weighted Runs Created, which quantifies a player’s total offensive value, relative to the rest of the league since the start of the 2017 season. Throw in Trout’s decent defense and proficient base-stealing, and you have the league’s fourth-highest WAR total. And he’s gaining fast on current AL leader Altuve, who slowed down his pace of production slightly as the summer wore on, posting his worst on-base plus slugging rate in September. It’s a long shot, but Trout could pass Altuve in the next couple of weeks. Trout has been among the best players in baseball each full season he’s played. But he’s not only the best in his generation, he’s also the best player in history through ages 21-24. He’ll have to make up a little ground on Ty Cobb to extend that streak to age 25, but there’s no doubt that he’s on his way to an inner-circle Hall of Fame career. Even if Trout doesn’t manage to catch Altuve (or Cobb), he still has a legitimate shot at his third AL MVP award. While the WAR leaderboard doesn’t care about how good your team is, the same cannot be said for MVP voters. And that may be the best argument for Trout’s claim: The Angels are unexpectedly in the running for a wild-card spot, and they owe much of their success to Trout’s bat. To the Angels’ credit, they managed to slightly improve their playoff position in Trout’s absence, but their chances didn’t really take off until he came back. In retrospect, perhaps it was inevitable that Trout would make a run at league MVP. He is the king of consistency, after all. 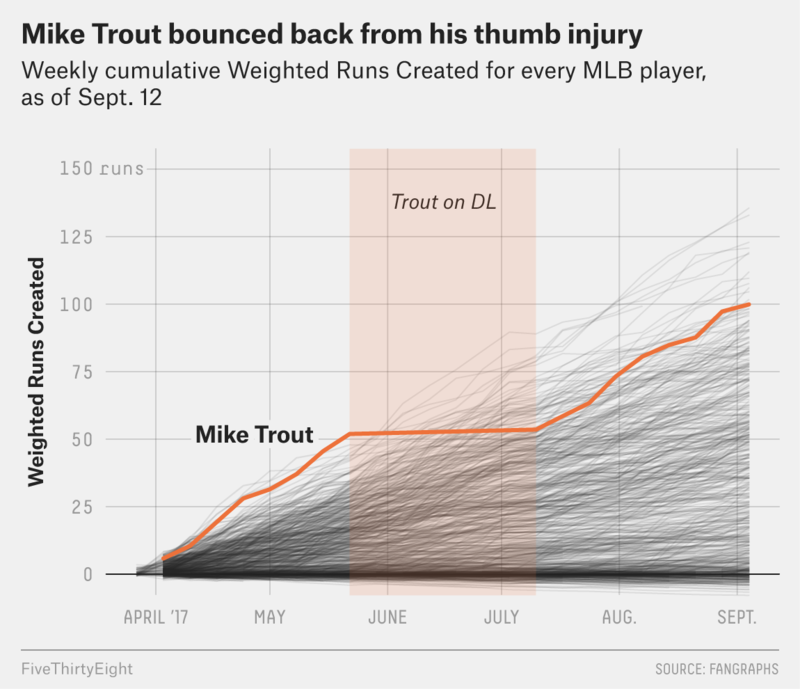 We can just add “injury” to the long list of factors, such as aging and opponent adjustments, that could end a mortal man’s career but barely seem to slow Trout.